Vortex – our best selling large parasol range. 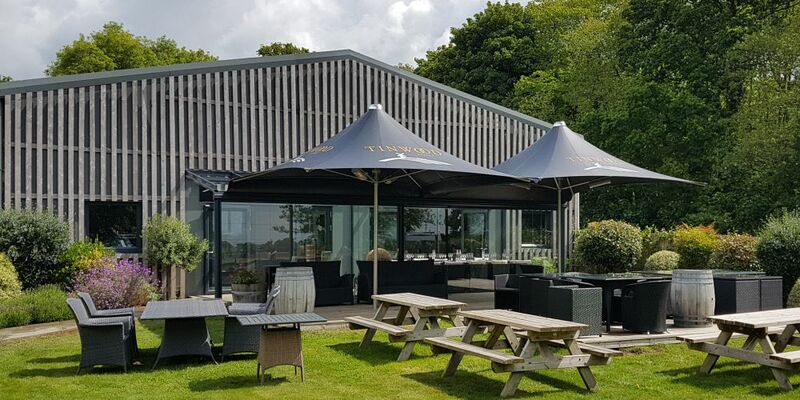 This ultra strong, high tensile parasol is manufactured in the UK with a stainless steel frame, fire retardant canopy and lots of options for heating and lighting. Available in square, rectangle or hexagonal shape format. 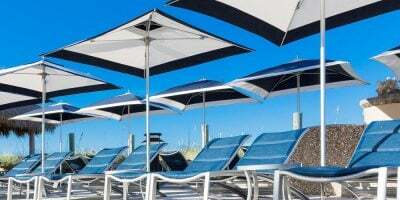 Tested to WIND FORCE 11 – Vortex parasols will stay up and open far longer than any other parasol or awning on the market. Now BS Certified to withstand wind speeds over 100km/h. 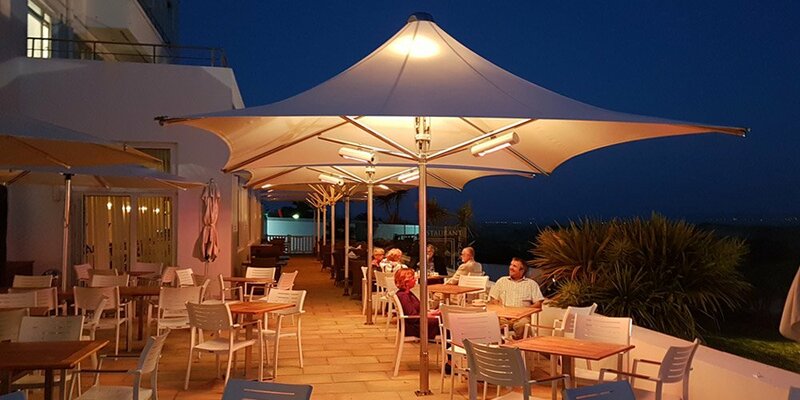 This is the ultimate solution for alfresco dining and smoking areas providing both shade and shelter all year round. Designed and manufactured in England. Standard with up to a 10 limited year warranty! The frame structure is manufactured from 316 tubular stainless steel. The Vortex is designed to be left up and open all year round (well, except possibly the one or two times in the year when we get very extreme weather!). The Vortex can be easily opened and closed. 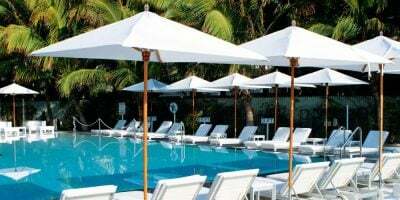 The Vortex parasol is a venture into an area few other manufacturers dare to go – high tensile, high strength parasols. 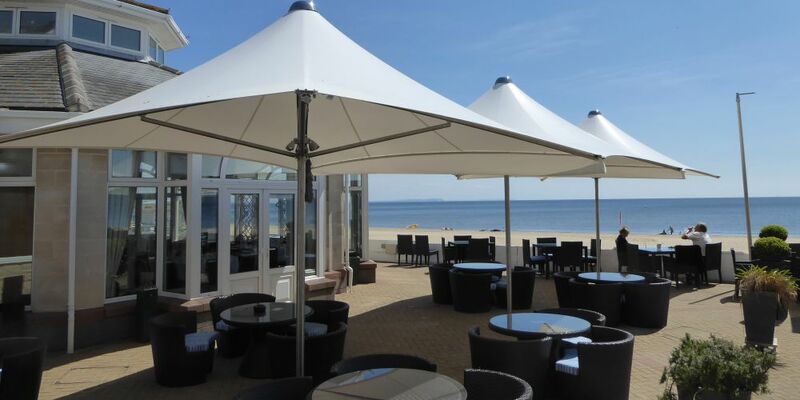 Vortex parasols can be fitted with Ferrari 502 Satin or 6002 Stam PVC fire retardant fabric in a range of 52 different colours. We have white fabric available ex stock, with limited other colours available ex stock or via order. Please check with us as there are often a limited number of other colours available from stock. Vortex parasols can be screen printed prior to production or have vinyl’s attached once the parasol is installed. In Ground Base – For permanent fixing of the Vortex parasols. An in ground base provides the best stability for the product. Electrical cables can be run through the ground through the ground base, completely hiding them. Deck Mount – Flat steel plate to be bolted to an existing solid surface. This provides a permanent fix in situations where it is not possible to install a ground base. Mobile base – Large steel base with concrete slabs. This allows for a non-permanent fix and although very heavy, this installation does allow the parasol to be moved. 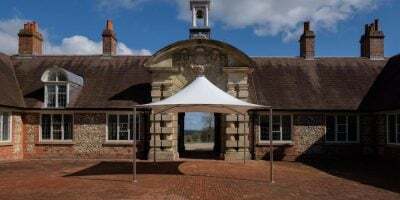 Existing ground bases – It is possible to install Vortex parasols into existing parasol bases from a number of manufacturers. Any ground base designed to accept a pole diameter of 76mm and more can be catered for. We can modify the parasol here to allow installation to existing ground bases. Please note that any warranty does not cover damage caused by failure of the existing ground base or bolts. Electrics can be added by a qualified electrician. We have designed the product with this in mind and it is easy to have electric IR heaters and / or lights fitted to the Vortex. This is best done prior to installation to ensure that the cables can be hidden correctly. Heating – We offer high grade Solamagic heaters. For fully integrated heating we offer a heater hub to allow the connection of up to 4 heaters. Heaters can also be retro fitted to parasols that have already been installed, using our retro fitted heaters with either 2 or 4 heaters. Lighting – Is pole mounted, using a light ring with 4 adjustable spot lights. These are supplied as standard with 50W standard bulbs but we are also able to offer an upgrade to coloured LED bulbs. Control and switching – We have available wireless remote switching units, to be able to independently control the heaters and the lights. Cabling and enclosures – are available ex stock. In order to make electricians installation simpler we have cabling and enclosures to the right size and specification in stock for immediate delivery. Wireless switches can be placed anywhere, even behind a bar, with no disruption to trade whilst the electrician chases in cables. This technology can provide users a number of benefits over conventional switching options. 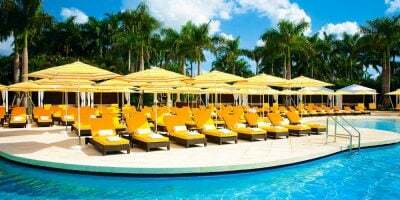 Other options – as there is no winder mechanism taking up space inside the pole, the potential options for other entertainment systems are almost limitless. Sound – It is possible to add speaker cable within the parasol and speakers high up inside the canopy. Outdoor LCD screens could be added and mounted to the pole. With careful shielding of any electrical and aerial cables it would be possible to have a TV feed piped directly to a couple of LCD screens mounted onto the centre of the pole.